I read an article in the Great Lakes Echo this past week about plant poaching, the lesser-known but equally-disturbing cousin to wildlife poaching. The article quoted Thomas Schneider, a former naturalist at a state-run nature center in Michigan, who said the center made a “costly mistake” when it built a boardwalk into a bog at the site, giving visitors access to an unusual habitat and the plants it contained. “There were some very rare orchids in that bog at the time, the late 1970s,” said Schneider. “They were there every year until word got out how easy the bog was to visit.” And, presumably, how easy the orchids were to dig up and carry off. It’s a conundrum. Part of the mission of many nature centers is to convince people how special the place is, and how worthy of protection. But the unintended corollary message is that a place worth protecting is often worth stealing. Back when I began my career as a naturalist along the Blue Ridge Parkway in Virginia and North Carolina, I got to witness firsthand the never-ending battle between park rangers and the park visitors who thought it was okay to uproot azaleas and rhododendrons along the roadside to take home, or local “entrepreneurs” who snuck into the woods to steal ginseng and other valuable roots. Later, I worked with the Missouri Department of Conservation, and spent time walking publicly-owned glades with the agency’s herpetologist, who would point out the rocks that had been flipped by people searching for unusual snakes and lizards to sell. So what are nature center administrators to do? How do they juggle the desire to let people experience the exciting rarities of nature without giving them the opportunity to cart them off? 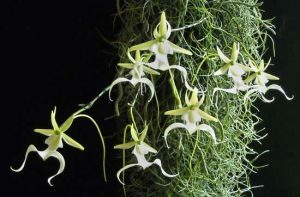 Back in 2007, the National Audubon Society’s Corkscrew Swamp Sanctuary staff discovered some spectacular blooms on a very rare ghost orchid (Dendrophylax lindenii). The plant was close enough to an existing boardwalk to be easily seen through binoculars. Should they let the public know? Ghost orchids are endangered and legally protected. They are also highly coveted by orchid aficionados, and frequently poached. (Susan Orlean’s 2000 best-selling book The Orchid Thief is about this species.) Should they tell people about it, or keep quiet? They decided to publicize it. But they made a thoughtful decision. The plant was well protected: 50 feet up in a cypress tree, surrounded by alligator-infested swamp, along a heavily-trafficked boardwalk that was closed and essentially inaccessible at night. The ghost orchid became a big hit, generating great interest and significantly boosting attendance to the center. And it’s still there.